In this post, we go right at the heart of classical physics. It’s going to be a very long post – and a very difficult one – but it will really give you a good ‘feel’ of what classical physics is all about. To understand classical physics – in order to compare it, later, with quantum mechanics – it’s essential, indeed, to try to follow the math in order to get a good feel for what ‘fields’ and ‘charges’ and ‘atomic oscillators’ actually represent. 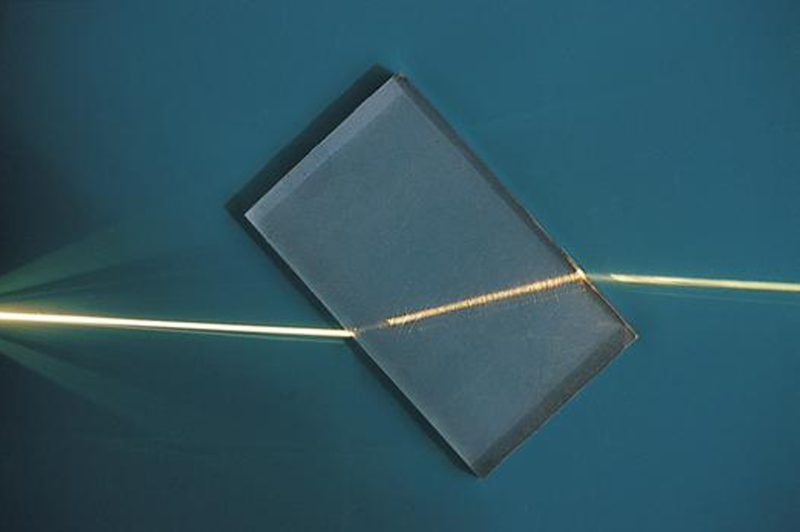 As for the topic of this post itself, we’re going to look at refraction again: light gets dispersed as it travels from one medium to another, as illustrated below. 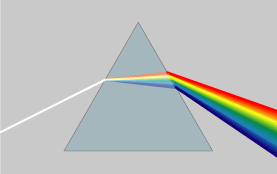 Dispersion literally means “distribution over a wide area”, and so that’s what happens as the light travels through the prism: the various frequencies (i.e. the various colors that make up natural ‘white’ light) are being separated out over slightly different angles. In physics jargon, we say that the index of refraction depends on the frequency of the wave – but so we could also say that the breaking angle depends on the color. But that sounds less scientific, of course. In any case, it’s good to get the terminology right. Generally speaking, the term refraction (as opposed to dispersion) is used to refer to the bending (or ‘breaking’) of light of a specific frequency only, i.e. monochromatic light, as shown in the photograph below. […] OK. We’re all set now. It is interesting to note that the photograph above shows how the monochromatic light is actually being obtained: if you look carefully, you’ll see two secondary beams on the left-hand side (with an intensity that is much less than the central beam – barely visible in fact). That suggests that the original light source was sent through a diffraction grating designed to filter only one frequency out of the original light beam. That beam is then sent through a bloc of transparent material (plastic in this case) and comes out again, but displaced parallel to itself. So the block of plastics ‘offsets’ the beam. So how do we explain that in classical physics? As I mentioned in my previous post, the Greeks had already found out, experimentally, what the index of refraction was. 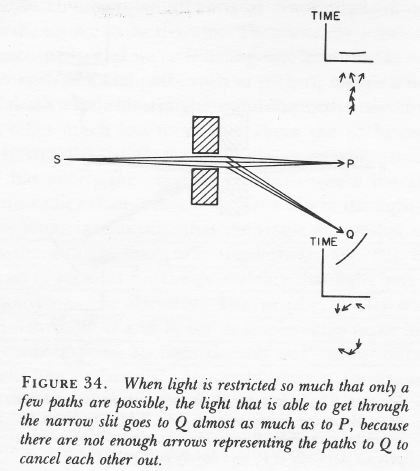 To be more precise, they had measured the θ1 and θ2 – depicted below – for light going from air to water. 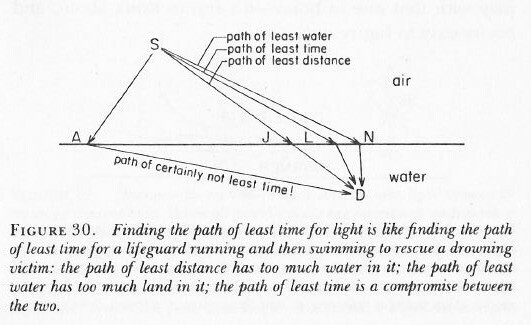 For example, if the angle in air (θ1) is 20°, then the angle in the water (θ2) will be 15°. It the angle in air is 70°, then the angle in the water will be 45°. Of course, it should be noted that a lot of the light will also be reflected from the water surface (yes, imagine the romance of the image of the moon reflected on the surface of glacial lake while you’re feeling damn cold) – but so that’s a phenomenon which is better explained by introducing probability amplitudes, and looking at light as a bundle of photons, which we will not do here. I did that in previous posts, and so here, we will just acknowledge that there is a reflected beam but not say anything about it. N is just the number of charges (electrons) per unit volume of the material (e.g. the water, or that block of plastic), and qe and m are just the charge and mass of the electron. And then you have that electric constant once again, ε0, and… Well, that’s it ! That’s not too terrible, is it? So the only variables on the right-hand side are ω0 and ω, so that’s (i) the resonant frequency of the material (or the atoms – well, the electrons bound to the nucleus, to be precise, but then you know what I mean and so I hope you’ll allow me to use somewhat less precise language from time to time) and (ii) the frequency of the incoming light. The equation above is referred to as the dispersion relation. It’s easy to see why: it relates the frequency of the incoming light to the index of refraction which, in turn, determinates that angle θ. 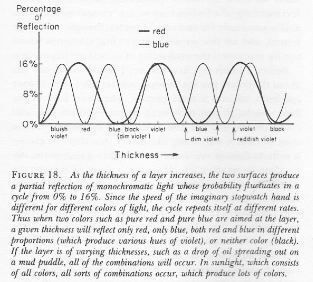 So the formula does indeed determine how light gets dispersed, as a function of the frequencies in it, by some medium indeed (glass, air, water,…). Second, it’s obvious that the index of refraction depends on two variables indeed: the natural, or resonant frequency, ω0, and the frequency ω, which is the frequency of the incoming light. For most of the ordinary gases, including those that make up air (i.e. nitrogen (78%) and oxygen (21%), plus some vapor (averaging 1%) and the so-called noble gas argon (0.93%) – noble because, just like helium and neon, it’s colorless, odorless and doesn’t react easily), the natural frequencies of the electron oscillators are close to the frequency of ultraviolet light. [The greenhouse gases are a different story – which is why we’re in trouble on this planet. Anyway…] So that’s why air absorbs most of the UV, especially the cancer-causing ultraviolet-C light (UVC), which is formally classified as a carcinogen by the World Health Organization. The wavelength of UVC light is 100 to 300 nanometer – as opposed to visible light, which has a wavelength ranging from 400 to 700 nm – and, hence, the frequency of UV light is in the 1000 to 3000 Teraherz range (1 THz = 1012 oscillations per second) – as opposed to visible light, which has a frequency in the range of 400 to 800 THz. So, because we’re squaring those frequencies in the formula, ω2 can then be disregarded in comparison with ω02: for example, 15002 = 2,250,000 and that’s not very different from 15002 – 5002 = 2,000,000. Hence, if we leave the ω2 out, we are still dividing by a very large number. That’s why n is very close to one for visible light entering the atmosphere from space (i.e. the vacuum). Its value is, in fact, around 1.000292 for incoming light with a wavelength of 589.3 nm (the odd value is the mean of so-called sodium D light, a pretty common yellow-orange light (street lights! ), so that’s why it’s used as a reference value – however, don’t worry about it). OK. […] So that’s just to note that we can have a refraction index that is smaller than one and that’s not ‘anomalous’ – even if that’s a historical term that has survived. Finally, last but not least as they say, you may have heard that scientists and engineers have managed to construct so-called negative index metamaterials. That matter is (much) more complicated than you might think, however, and so I’ll refer you to the Web if you want to find out more about that. So, as I explained in my previous post, the source creates an oscillating electromagnetic field which will shake the electrons up and down in the glass plate, and then these shaking electrons will generate their own waves. So we look at the glass as an assembly of little “optical-frequency radio stations” indeed, that are all driven with a given phase. It creates two new waves: one reflecting back, and one modifying the original field. Let’s be more precise. What do we have here? First, we have the field that’s generated by the source, which is denoted by Es above. Then we have the “reflected” wave (or field – not much difference in practice), so that’s Eb. As mentioned above, this is the classical theory, not the quantum-electrodynamical one, so we won’t say anything about this reflection really: just note that the classical theory acknowledges that some of the light is effectively being reflected. OK. Now we go to the other side of the glass. What do we expect to see there? If we would not have the glass plate in-between, we’d have the same Es field obviously, but so we don’t: there is a glass plate. 🙂 Hence, the “transmitted” wave, or the field that’s arriving at point P let’s say, will be different than Es. Feynman writes it as Es + Ea. Snell’s Law – or Ibn Sahl’s Law – was re-formulated, by a 17th century French lawyer with an interesting in math and physics, Pierre de Fermat, as the Principle of Least Time. It is a way of looking at things really – but it’s very confusing actually. Fermat assumed that light traveling through a medium (water or glass, for instance) would travel slower, by a certain factor n, which – indeed – turns out to be the index of refraction. But let’s not run before we can walk. The Principle is illustrated below. If light has to travel from point S (the source) to point D (the detector), then the fastest way is not the straight line from S to D, but the broken S-L-D line. Now, I won’t go into the geometry of this but, with a bit of trial and error, you can verify for yourself that it turns out that the factor n will indeed be the same factor n as the one which was ‘discovered’ by Ibn Sahl: sinθ1 = n sinθ2. What we have then, is that the apparent speed of the wave in the glass plate that we’re considering here will be equal to v = c/n. The apparent speed? So does that mean it is not the real speed? Hmm… That’s actually the crux of the matter. The answer is: yes and no. What? An ambiguous answer in physics? Yes. It’s ambiguous indeed. What’s the speed of a wave? We mentioned above that n could be smaller than one. Hence, in that case, we’d have a wave traveling faster than the speed of light. How can we make sense of that? 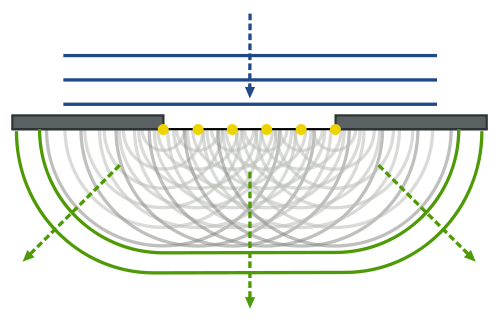 We can make sense of that by noting that the wave crests or nodes may be traveling faster than c, but that the wave itself – as a signal – cannot travel faster than light. It’s related to what we said about the difference between the group and phase velocity of a wave. The phase velocity – i.e. the nodes, which are mathematical points only – can travel faster than light, but the signal as such, i.e. the wave envelope in the illustration below, cannot. 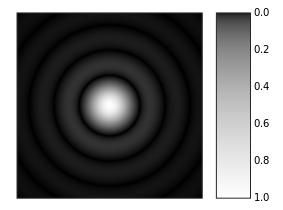 In case (b), the phase of the transmitted wave will appear to be delayed, which results in the wave appearing to travel slower, because the distance between the wave crests, i.e. the wavelength λ, is being shortened. In case (c), it’s the other way around: the phase appears to be advanced, which translated into a bigger distance between wave crests, or a lengthening of the wavelength, which translates into an apparent higher speed of the transmitted wave. So here we just have a mathematical relationship between the (apparent) speed of a wave and its wavelength. The wavelength is the (apparent) speed of the wave (that’s the speed with which the nodes of the wave travel through space, or the phase velocity) divided by the frequency: λ = vp/f. However, from the illustration above, it is obvious that the signal, i.e. 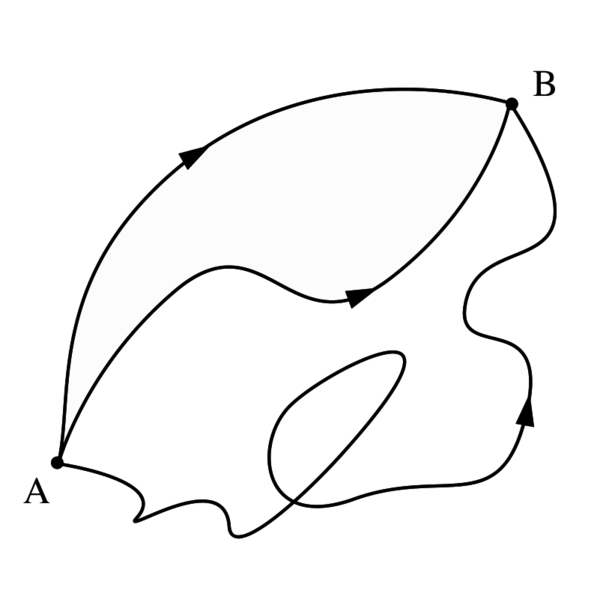 the start of the wave, is not earlier – or later – for either wave (b) and (c). In fact, the start of the wave, in time, is exactly the same for all three cases. Hence, the electromagnetic signal travels at the same speed c, always. While this may seem obvious, it’s quite confusing, and therefore I’ll insert one more illustration below. What happens when the various wave fronts of the traveling field hit the glass plate (coming from the top-left hand corner), let’s say at time t = t0, as shown below, is that the wave crests will have the same spacing along the surface. That’s obvious because we have a regular wave with a fixed frequency and, hence, a fixed wavelength λ0, here. Now, these wave crests must also travel together as the wave continues its journey through the glass, which is what is shown by the red and green arrows below: they indicate where the wave crest is after one and two periods (T and 2T) respectively. Now, the frequency is the same, but so the wavelength is shortened as the wave travels through the various layers of electron oscillators, each causing a delay of phase – and, hence, a shortening of the wavelength, as shown above. But, if f is the same, and the wavelength is shorter, then vp cannot be equal to the speed of the incoming light, so vp ≠ c. The apparent speed of the wave traveling through the glass, and the associated shortening of the wavelength, can be calculated using Snell’s Law. Indeed, knowing that n ≈ 1.33, we can calculate the apparent speed of light through the glass as v = c/n ≈ 0.75c and, therefore, we can calculate the wavelength of the wave in the glass l as λ = 0.75λ0. The field in the glass sheet must have the shape that’s depicted above: there is no other way. So that means the direction of ‘propagation’ has been changed. As mentioned above, however, the direction of propagation is a ‘mathematical’ property of the field: it’s not the speed of the ‘signal’. Because the direction of propagation is normal to the wave front, it implies that the bending of light rays comes about because the effective speed of the waves is different in the various materials or, to be even more precise, because the electron oscillators cause a delay of phase. 1. From everything I wrote about oscillators in previous posts, you should remember that the equation for this motion can be written as m[d2x/dt2 + ω02) = F. That’s just Newton’s Law. Now, the driving force F comes from the electric field and will be equal to F = qeEs. Just to make sure you understand what we’re doing: this piece gives us the motion of the electrons in the plate. That’s all. This formula introduces just one new variable, η, which is the number of charges per unit area of the plate (as opposed to N, which was the number of charges per unit volume in the plate), so that’s quite straightforward. Less straightforward is the formula itself: this formula says that the magnitude of the field is proportional to the velocity of the charges at time t – z/c, with z the shortest distance from P to the plane of charges. That’s a bit odd, actually, but so that’s the way it comes out: “a rather simple formula”, as Feynman puts it. 3. As mentioned above, z is the distance from P to the plate. Let’s look at the set-up here once again. The transmitted wave, or Eafter the plate as we shall note it, consists of two components: Es and Ea. Es here will be equal to (the real part of) Es = E0eiω(t-z/c). Why t – z/c instead of just t? Well… We’re looking at Es here as measured in P, not at Es at the glass plate itself. We get this by just substituting t for t – Δt. So what? Well… We have a product of two complex numbers here and so we know that this involves adding angles – or substracting angles in this case, rather, because we’ve got a minus sign in the exponent of the first factor. So, all that we are saying here is that the insertion of the glass plate retards the phase of the field with an amount equal to w(n-1)Δz/c. What about that sum Eafter the plate = Es + Ea that we were supposed to get? Why is Ea perpendicular to Es? Well… Look at the –i = 1/i factor. Multiplication with –i amounts to a clockwise rotation by 90°, and then just note that the magnitude of the vector must be small because of the ω(n-1)Δz/c factor. 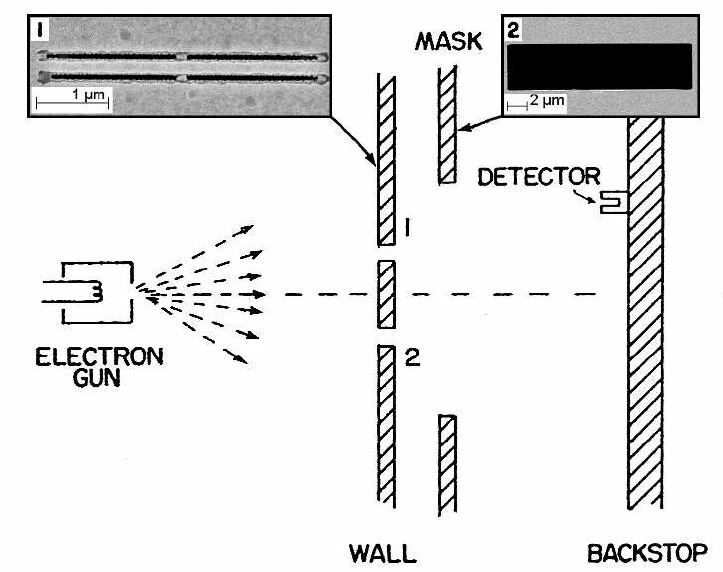 The model we used to explain the index of refraction had electron oscillators at its center. In the analysis we did, we did not introduce any damping factor. That’s obviously not correct: it means that a glass plate, once it had illuminated, would continue to emit radiation, because the electrons would oscillate forever. When introducing damping, the denominator in our dispersion relation becomes m(ω02 – ω2 + iγω), instead of m(ω02 – ω2). We derived this in our posts on oscillators. What it means is that the oscillator continues to oscillate with the same frequency as the driving force (i.e. not its natural frequency) – so that doesn’t change – but that there is an envelope curve, ensuring the oscillation dies out when the driving force is no longer being applied. The γ factor is the damping factor and, hence, determines how fast the damping happens. This is the same formula that we had derived already, but so we have an extra exponential factor: e–ωn’’Δz/c. It’s an exponential factor with a real exponent, because there were two i‘s that cancelled. The e-x function has a familiar shape (see below): e-x is 1 for x = 0, and between 0 and 1 for any value in-between. That value will depend on the thickness of the glass sheet. Hence, it is obvious that the glass sheet weakens the wave as it travels through it. Hence, the wave must also come out with less energy (the energy being proportional to the square of the amplitude). That’s no surprise: the damping we put in for the electron oscillators is a friction force and, hence, must cause a loss of energy. Note that it is the n’’ term – i.e. the imaginary part of the refractive index n – that determines the degree of absorption (or attenuation, if you want). Hence, n’’ is usually referred to as the “absorption index”. So we have a curve with a positive slope, and a value n > 1, for most frequencies, except for a very small range of ω’s for which the slope is negative, and for which the index of refraction has a value n < 1. As Feynman notes, these ω’s– and the negative slope – is sometimes referred to as ‘anomalous’ dispersion but, in fact, there’s nothing ‘abnormal’ about it. The interesting thing is the iγkω term in the denominator, i.e. the imaginary component of the index, and how that compares with the (real) “resonance term” ωk2– ω2. If the resonance term becomes very small compared to iγkω, then the index will become almost completely imaginary, which means that the absorption effect becomes dominant. We can see that effect in the spectrum of light that we receive from the sun: there are ‘dark lines’, i.e. frequencies that have been strongly absorbed at the resonant frequencies of the atoms in the Sun and its ‘atmosphere’, and that allows us to actually tell what the Sun’s ‘atmosphere’ (or that of other stars) actually consists of. So… There we are. I am aware of the fact that this has been the longest post of all I’ve written. I apologize. But so it’s quite complete now. The only piece that’s missing is something on energy and, perhaps, some more detail on these electron oscillators. But I don’t think that’s so essential. It’s time to move on to another topic, I think. When talking diffraction, one of the more amusing curves is the curve showing the intensity of light near the edge of a shadow. It is shown below. Light becomes more intense as we move away from the edge, then it overshoots (so it is brighter than further away), then the intensity wobbles and oscillates, to finally ‘settle’ at the intensity of the light elsewhere. How do we get a curve like that? We get it through another amusing curve: the Cornu spiral (which was re-named as the Euler spiral for some reason I don’t understand), which we’ve encountered also when adding probability amplitudes. Let me first depict the ‘real’ situation below: we have an opaque object AB, so no light goes through AB itself. However, the light that goes past it, casts a shadow on a screen, which is denoted as QPR here. And so the curve above shows the intensity of the light near the edge of that shadow. So we do the same here. 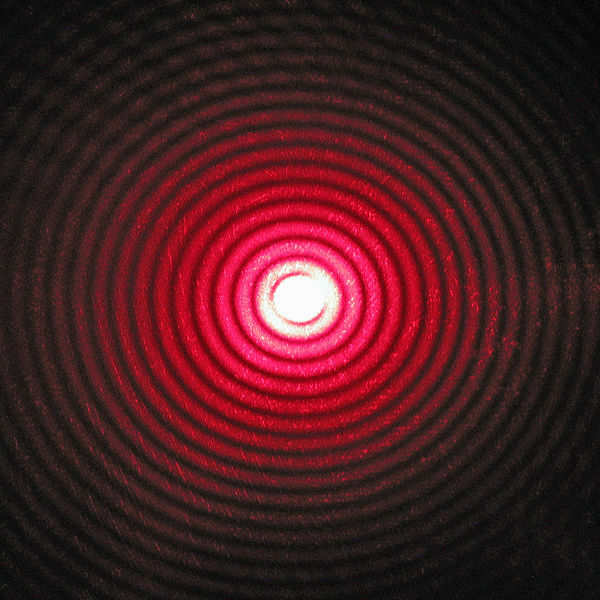 We assume that we have a series of closely spaced ‘antennas’, or sources, starting from B, up to D, E, C and all the way up to infinity, and so we need to add the contributions – or the waves – from these sources to calculate the intensity at all of the points on the screen. Let’s start with the (random) point P. P defines the inflection point D: we’ll say the phase there is zero (because we can, of course, choose our point in time so as to make it zero). So we’ll associate the contribution from D with a tiny vector (an infinitesimal vector) with angle zero. That is shown below: it’s the ‘flat’ (horizontal) vector pointing straight east at the very center of this so-called Cornu spiral. So we start from BP and go all the way… Well… You see that, once, we’re ‘up north’, in the center of the upper-most spiral, we’re not adding much anymore, because the additional vectors are just sharply changing direction and going round and round and round. In short, most of the contribution to the amplitude of the resultant vector BP∞ is given by points near D. Now, we have chosen point P randomly, and you can easily see from that Cornu spiral that the amplitude, or the intensity rather (which is the square of the amplitude) of that vector BP∞, increases initially, to reach some maximum, depending upon where P is located above B, but then it falls and oscillates indeed, producing the curve with which we started this post. This was rather short, isn’t it? I hope you liked it because… Well… What will follow is actually much more boring, because it involves a lot more formulas. However, these formulas will help us get where we want to get, and that is to understand – somehow, if only from a classical perspective – why that empty space acts like an array of electromagnetic radiation sources. Indeed, when everything is said and done, that’s the deep mystery of light really. Really really deep.